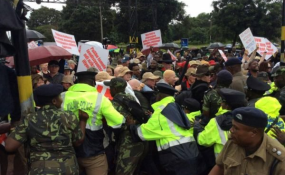 Police block APAM demonstrators from reaching State House. Association of Persons with Albinism in Malawi (APAM) has questioned the credibility and integrity of the presidential commission of inquiry into attacks, abductions and killings of persons with albinism (PWAs). President Peter Mutharika appointed eight members to the enquiry on March 5 this year and which included retired Supreme Court judge Robert Chinangwa who is the chairperson, Abgail Dzimadzi, Paramount Chief Kawinga, Rexa Chalera, Malawi Health Equity Network (Mhen) executive director George Jobe and Brenda Vokhiwa-Kapenda as the secretary. The two others are the Reverend Timothy Nyasulu and Grace Massa. But in a statement made available to Nyasa Times, signed by Apam vocal president Overstone Kondowe, said they have been "hoodwinked" and the body is not contented with the instituted commission of inquiry. "The composition problem of the Commission of Inquiry in essence leaves APAM to doubt the credibility of the outcome or findings of such a Commission of Inquiry way before it releases a report," reads part of the report. Apam argues that the Commissioners have capacity gaps to conduct such high level investigation.
" A few years back government was advised to involve the Malawi Police Service and the Malawi Human Rights Commission (MHRC) and other important players on the UNICEF funded study that was commissioned by the Department of Disability and Elderly Affairs. But what happened? Important actors like MHRC were not even reached for interviews or expertise during the study. The study was carried out as a mere study exercise as we know research activities. As a result the study did not establish desirable results," reads the statement. Apam added that the terms of reference of the commission of inquiry were not made public and were not shared with other relevant authorities in order for the public to appreciate the scope and approaches of the Commission of Inquiry and also to ably assess the work of the probe team in light of the findings to be established. "The Terms of Reference were supposed to be made public and shared with APAM and other relevant actors," reads part of the statement. The association has also echoed other stakeholders' observation that President Mutharika's remarks during the swearin-n of the commissioner, he was issuing orders to inquiry team on who to listen to and areas to focus on (and those not to focus on), saying that can be outrightly interpreted as a deliberate tactic to interfere with the work of the Commission. "We fear that such subjective remarks will influence the commission to look away from such allegations which are already implicating some public figures. The expectation of the Public was that President Mutharika would stick to giving the Commission the terms of reference and reporting procedures and deadlines," reads the statement. "Telling the Commission what to do and what to look for is outrageous," said Apam. Apam insists that it makes sense for an independent investigator (outside government) to probe the matter. "APAM views that unless we have some independent elements, we can't have an effective investigation or inquiry. Common understanding and acceptability based on its credibility, reliability and integrity of the members is very crucial and key in our present case. In the present case we can't even trust the State authorities since in other African countries such State functionaries and politicians have been involved in the heinous activities." Apam has also made a sweeping statement that the presidential Commission of Inquiry is "staged" as the association holds reservations against the team in terms of its composition and methodology. It said the independence of the inquiry is a farfetched idea as President Mutharika has already demonstrated interference in the inquiry. Apam said it will continue working with government and whosoever in the highest office of the land to fully honor the National Action Plan for Persons with Albinism. But the Commission chair Chinangwa said they will execute its duties with diligence and commitment to ensure that it meets the April 30 deadline for report submission. Since November 2014, the number of reported crimes against people with albinism in Malawi has risen to 152 cases, including 25 murders and more than 10 people missing, according to Apam.